Local orthopedic surgeon repeats in America’s top 1% - Orthopedic Surgeon For Hip, Knee Surgeries at Zehr Center In Naples Florida. NAPLES, Fla. (May 23, 2018) – Robert J. Zehr, M.D. of the Zehr Center for Orthopaedics and Seaside Surgery Center has again been named to American Registry’s list of “America’s Most Honored Professionals 2018 – Top 1%.” Honorees must have been continuously recognized for professional excellence in their industry for the past five years. Consistently chosen by his peers as a “Castle Connolly Top Doctor” for the past 14 years, Dr. Zehr has appeared on the cover of Gulfshore Life Magazineas one of its Top Doctors and was featured in the magazine’s inaugural issue of Healthy Living. 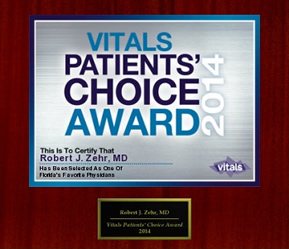 As to patient reviews, Dr. Zehr has received the highest ratings and rankings on several online review sites. 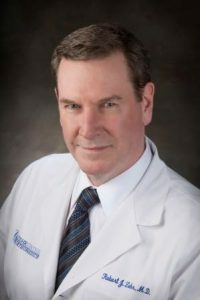 He has received the “Patients’ Choice Award” from Vitals.com annually since 2009 and has repeatedly been voted one of “America’s Most Compassionate Doctors.” He has received 23 awards from Vitals over the years. Of the 106 local (within 50 miles of Naples) orthopedic surgeons listed on HealthGrades.com, 22 doctors have received five-star ratings but only two have been reviewed more than 100 times, with Dr. Zehr receiving 170 reviews. 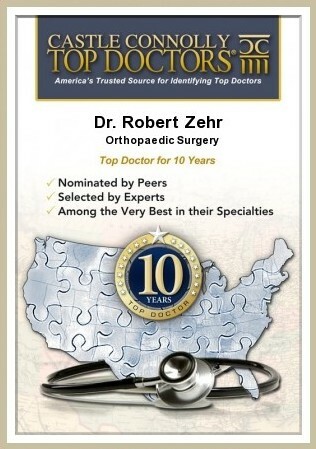 On HealthcareReviews.com, Dr. Zehr has earned a 9 out of 10 rating with 95 reviews. On DrsScore.com, his 123 ratings have earned him a score of 9.8 out of 10. About Dr. Robert J. Zehr: Robert J. Zehr, MD is a board-certified, fellowship-trained orthopaedic surgeon with over 30 years of experience, who specializes in hip and knee replacement surgery. He is the founder of The Zehr Center for Orthopaedics; a private orthopaedic surgery practice located in Naples, FL. The leading hip replacement surgeon in Collier County, Dr. Zehr pioneered the direct anterior approach to hip replacement in Southwest Florida and has performed over 1,600 of the procedures. He was the first surgeon in the area to perform same-day outpatient total hip replacement surgery. He conducted the surgery at the Seaside Surgery Center, of which he is co-founder, CEO, and Medical Director. Consistently chosen as a Castle Connolly Top Orthopaedic Surgeon, Dr. Zehr has won numerous awards from peers and patients alike and ranks as one of the Top Ten Orthopaedic Surgeons in the World according to RateMDs.com.